Heartland Behavioral Health Services is the leading pediatric behavioral health hospital in the Midwest. Located in Nevada, Missouri, we have provided exceptional quality acute and residential care for kids for over 100 years. We aim to address each child’s personal needs, and deliver specialized care to children and adolescents. A short term crisis stabilization service for male and female patients ages 4 to 17. We offer a multitude creative therapies to allow for children to heal in unique ways. Equine Assisted Psychotherapy (EAP) incorporates horses for emotional growth and learning. From the admissions process, to completing her treatment,everything was wonderful. We have a facility closer to us but chose yours because of the care that you provide. We highly recommend you. Most days I feel different. Today I feel welcome. I appreciate the positive feelings people bring here. I feel safe and I feel hope for the first time in a long time. In the horses eyes, I am a powerful girl, loving and smiley. I am someone who is trying to overcome my past, I am caring, supportive, gorgeous, and happy. I am someone who has tried so hard and I am worth living for. Everyone from your staff did an excellent job with handling the situation without letting the stress interfere. The (admissions) process was wonderful and flawless. We appreciate all that you guys do for our office, which is why we always call you first. If you’re looking for an opportunity to build the career of your dreams and join a team of professionals passionate about helping to make a difference in the lives of children and adolescents, Heartland may be the place for you. Heartland Behavioral Health Services is proud to partner with National Action Alliance for Suicide Prevention. The Joint Commission Gold Seal of Approval demonstrates that Heartland Behavioral Health Services has proven to operate at the standard of quality set by The Joint Commission. Stay up-to-date on our local news & events and see our ongoing involvement in the community. Our team of professionals is dedicated to providing prompt access to services in a compassionate and confidential environment. 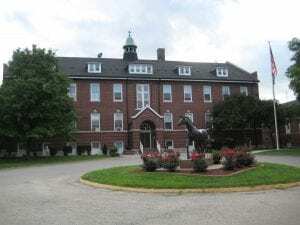 A horse statue stands on the serene grounds at the entrance to Heartland Behavioral Health Services. Heartland sits on 50 acres on the outskirts of Nevada City, MO, 60 miles north of Joplin and 90 miles south of Kansas City. A playground is available for the youth patients of Heartland Behavioral Health Services. The Equestrian Therapy Program is a unique treatment option in which patients bond with horses. Our peaceful environment allows residents to return to the basics and reconnect with themselves and others. The game room at Heartland Behavioral Health Services features activities such as bowling. The game room also features foosball and board games that allow patients to relax with others. Ping pong is an additional game that patients can play in the facility game room. Patients may enjoy playing exciting games of air hockey while staying at Heartland Behavioral Health Services. Heartland takes great pride in its dedicated staff members, and many of them with been with us for decades.